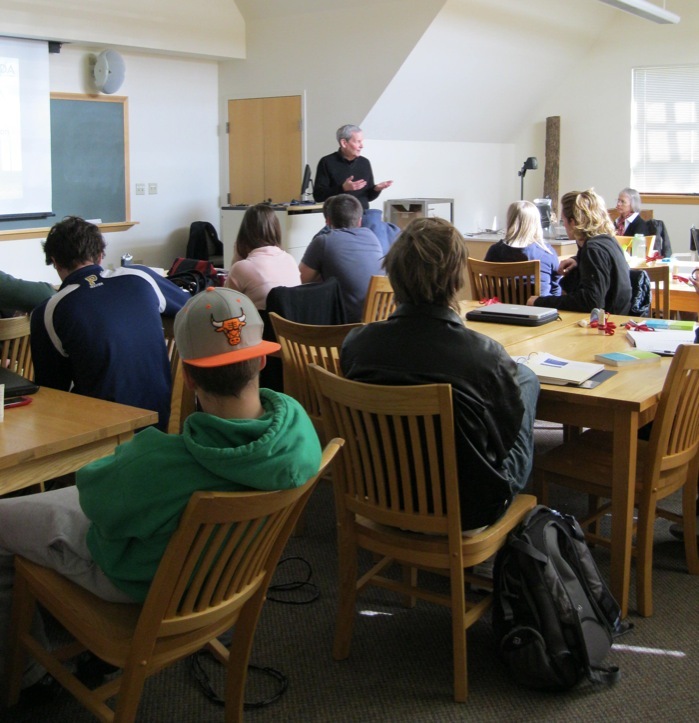 Students taking Introduction to Sustainability, Environmental Economics, and Environmental and Social Change are exploring ways to re-invent the models currently associated with agriculture, energy, architecture, industry, transportation, and waste disposal. Their research got a boost recently from two industry experts who visited campus. Dr. Charles Bennett, vice president of Aveda Corporation, spoke about the strategic and operational processes, including the cost benefits, involved in achieving “cradle to cradle” certification for the company’s product lines. Rejecting the assumption that human industry inevitably destroys the natural world, the cradle to cradle industrial model creates positive emissions, retains valuable materials for perpetual reuse, and purifies the air, water, and soil. What’s more, rather than simply producing less waste, this approach entirely eliminates the concept of waste.